My kids like to give me prank gifts at Christmas time. This is the first of two articles I am writing on prank gifts. This one is about a gift that I got which was not real but I wish it were, the next will be about a gift I got that was real and I wish it were not. 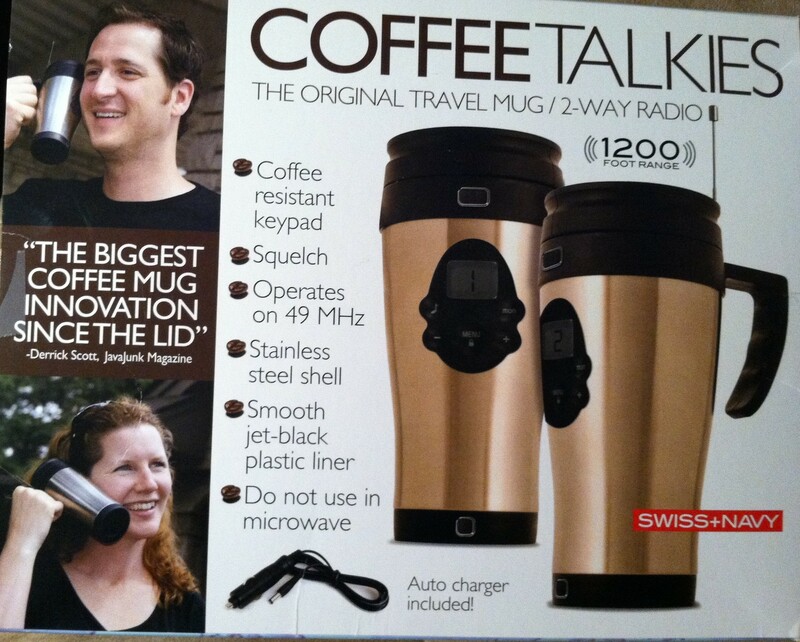 As you can see from the pictures in this article, this first item is called Coffee Talkies. First, a little background. My wife and I travel a lot. Like most couples, she likes to go off shopping while I prefer to do some sightseeing. We also take a lot of cruises which offers significant opportunity to get detached from each other. About a year ago I decided it was time to buy a set of walkie-talkies, since cell phones do not work aboard ships or in many locations to which we were traveling. Now, I am also a big coffee drinker and I always take a thermal mug with me so I could carry enough coffee, keep it hot, and not spill it everywhere. My son got wind of this and he found me a gift that supposedly combined these two devices into one. 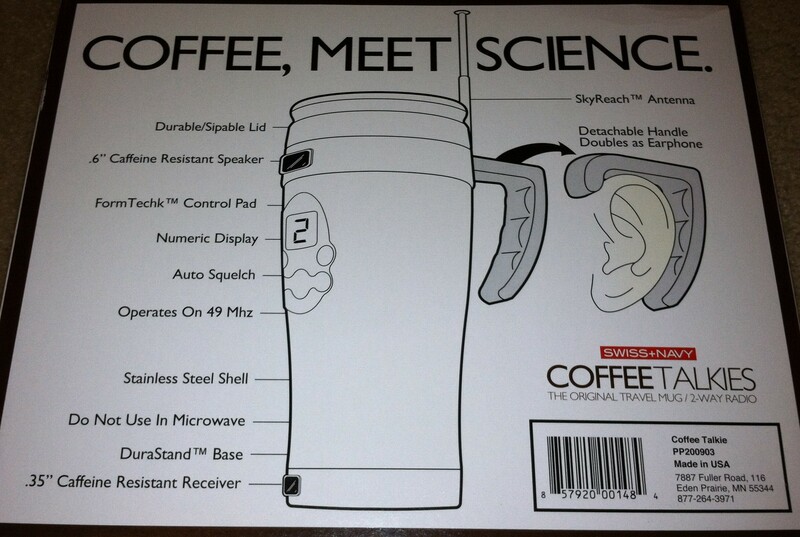 Coffee Talkies theoretically combined my coffee mug and the walkie-talkie, providing some interesting features, such as a detachable handle that doubles as an earphone (see graphic at right). I must say that, when I opened it, I was really excited and looking forward to something truly unique. It seemed like a gadget whose time had come. When I opened the box, the tabs said “prank you!” It was just an empty box to be used to package other gifts. Boy did I feel robbed!!! I do hope somebody comes up with cool device like this in the near future. If so, I will be the first to buy one. This is a great example of packaging. Keep it in mind as you build your business. However, I suggest having something inside the box if you want to stay in business. Posted on January 11, 2012, in Cool gadget and tagged coffee drinker, coffee mug, cool device, prank gifts, thermal mug, walkie talkies. Bookmark the permalink. Leave a comment.